Oh my! You were there at the right moment!! Great shot. You vividly tell the story of man’s deteriorating relationship to nature here, Krasimir. 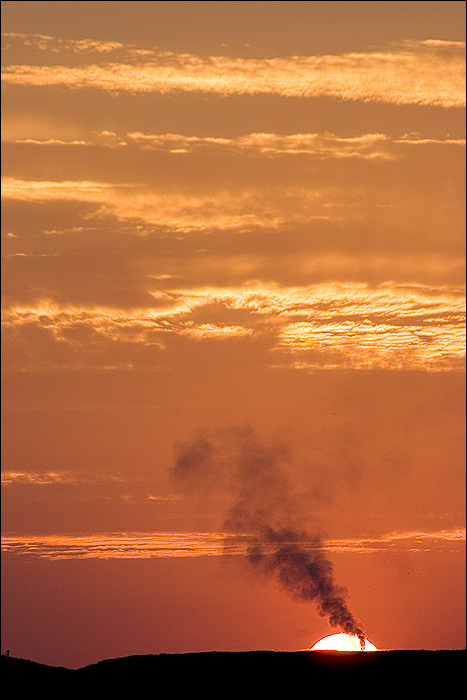 The diagonal plume of polluting smoke offers a stark contrast to the delicate golden layers of horizontal clouds that are stacked vertically along the golden sky. The brilliant setting sun seems to offer a warning to us all that man, in spite of all his knowledge, may be living on borrowed time. My favorite shots of yours are always those that tell a story, and the story here provokes thought and concern. Great shot, warm and nice colors. The smoke gives a lot to the picture.